This week for the Phimai festival there are some music concerts being played in Phimai town in the grounds of the local administration office (the amper) on the bypass not far from the police station. This interactive Google map shows the location of the concerts. Yesterday, the pop-rock singer/guitarist Sek Loso played. Tonight there is another concert. I think the group is called “Family” (Valentine?) but I’m not 100% sure. I’ve never heard of them. On Saturday 10th November, Kala (Gala /กะลา) will play. 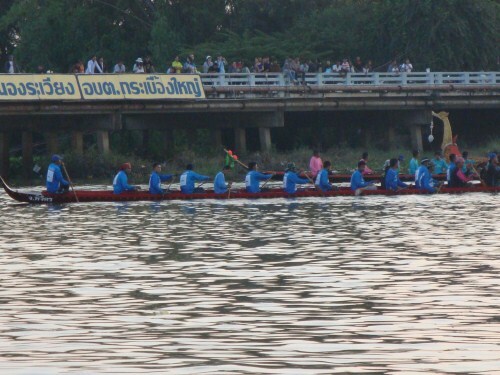 On Sunday the 11th, the popular Pongsit Kampee (พงษ์สิทธิ์ คำภีร์) – aka Pu – will play. Here are a couple of songs by Pongsit Kampee that are on Youtube. The first song is about a man who has 11 mistresses. He doesn’t understand how easy it is. It just happens! I really like this next song. It’s call ‘rien le ngaan‘ – study and work. If you are in Phimai, why not head along to see a concert. I believe they start at 10pm. The Phimai festival takes place each year in November. This year it is being held from the 7th to 11th November. At the Phimai festival you can see a bit of the local culture. There will be sound and light shows at the Phimai historical park, there will be a Korat Cat competition and two days of long boat racing. There will be traditional Thai dancing, singing (including traditional “Korat song”), stalls selling local foods and many other activities. There will also be a series of pop and pop-rock concerts by Thai singers. The concerts will take place in the grounds of the local administration office (amper) on the bypass. 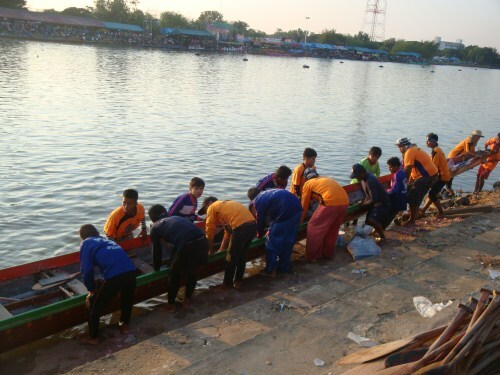 The Korat Cat competition usually takes place on the Saturday and the two days of long boat racing on Saturday and Sunday. Come to Phimai and enjoy the festival. Here are some photographs from previous Phimai festivals. Above: Putting the boat in the water before setting off to the start line. Below: End of the race for the blue team. Spectators watch from the road bridge. 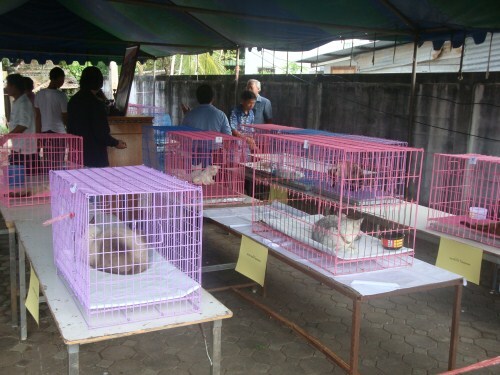 Below is a photograph taken at the Phimai festival cat show in 2009. 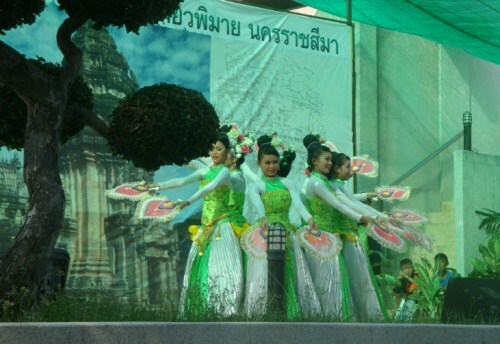 Below is a photograph taken at the dance contest at the Phimai festival in 2009. 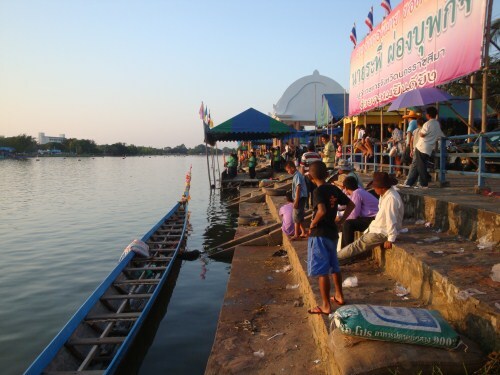 Note: Traffic in Phimai town is much increased during the period of the festival and some roads are blocked or diverted for the five days of the Phimai festival. Last night Sek Loso played a concert in Phimai. Tonight there is another concert. The group is called “Family” (Valentine?) I think, but I’m not 100% sure. I’ve never heard of them.